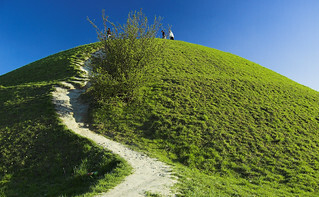 Wide-angle shot of the mound, which is a kind of ceremonial burial hill or something. There are a couple of other major ones around the town, which I'll get round to shooting sooner or later. Also, it looks like a gigantic tennis ball. I'd still miss if I swung a racket at it though.